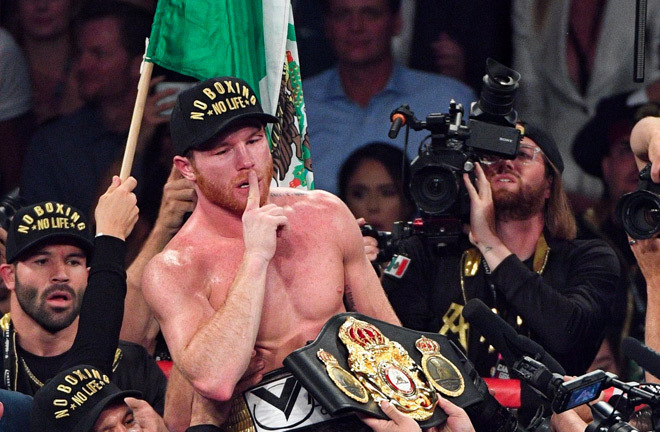 Canelo Alvarez celebrates his victory over Gennady Golovkin with his latest Belt and team. Photo Credit: @PowersImagery - Twitter. Canelo Alvarez settled the score by defeating Gennady Golovkin by majority decision in their middleweight world title rematch Saturday night live on HBO PPV, at the T-Mobile Arena in Las Vegas. Two of the judges scored the bout for Alvarez at 115-113 and the third judge Glenn Feldman scored it 114-114. However, CompuBox figures showed that Golovkin out landed Alvarez 234-202 but Alvarez had the edge in power punches, 143-116. Alvarez (50-1-2, 34 Kos) not only beat the bigger puncher Golovkin (38-1-1, 34 Kos) but took his WBA and WBC titles to combine with his own lineal championship. 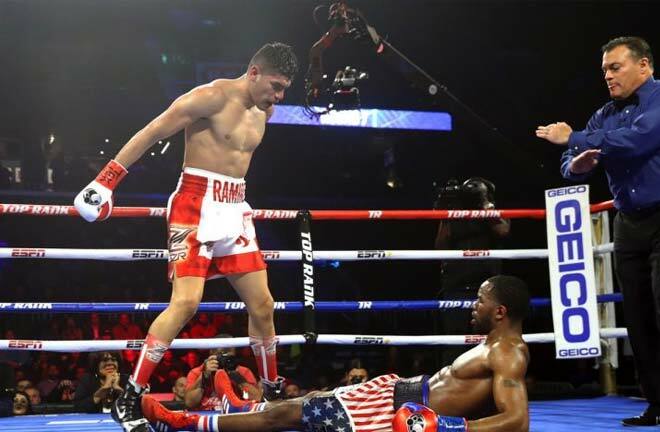 The hard-fought win also snapped the now former champion’s historic run of 20 title defenses which ties him with the legendary Bernard Hopkins. 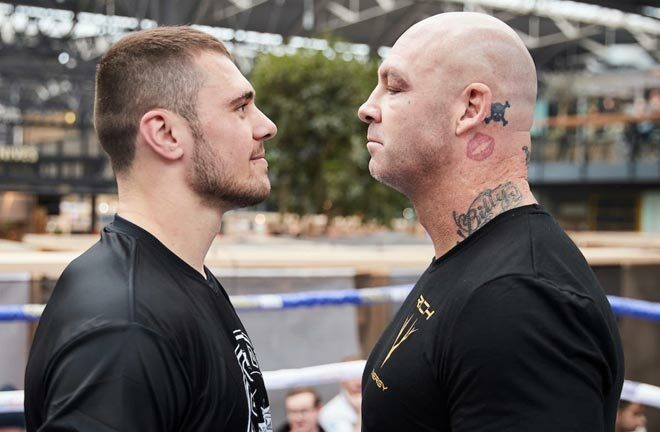 Both fighters increased their activity in this match and the result was a violent back and forth shootout at a break-neck pace intended to leave nothing to chance. Each fighter was marked up in this one with Golovkin sporting a cut above his right eye and a noticeable bruise below it while Alvarez suffered a laceration above his left eye. Golovkin set the pace early from the opening bell with a stiff jab that landed frequently throughout the bout. However, Alvarez made great use of his speed to counter the Golovkin at close range and even forced him to cover up at times. Both fighters traded some heavy hits with each other during a great night of boxing. Photo Credit: Twitter – @PowersImagery. Alvarez also became the first man to noticeably back Golovkin up by landing several good body shots in the first half of the fight and especially during the sixth round. Alvarez again showed a really good chin throughout and took a hellish uppercut from Golovkin in the fourth without much ill effect. 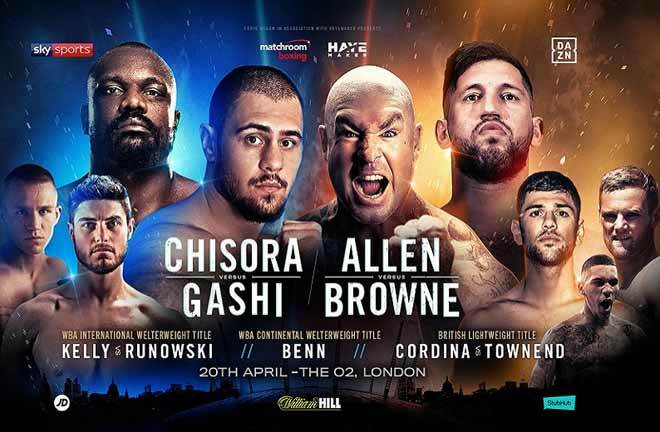 The action would intensify in the second half with Golovkin stepping up his attack with that reliable jab and landing some clean power shots. Alvarez was visibly hurt twice in round ten by power shots but showed tremendous resilience by remaining on his feet and fighting back. Canelo and Gennady pressed the action to close out rounds eleven and twelve with both trading heavy shots. You could tell that they were a bit fatigued by the cumulative pace of the entire fight. Golovkin was more aggressive but Alvarez appeared to be more effective with his body shots and perhaps did enough by landing the cleaner shots to nick these rounds and ultimately tilt the entire fight in his favor. 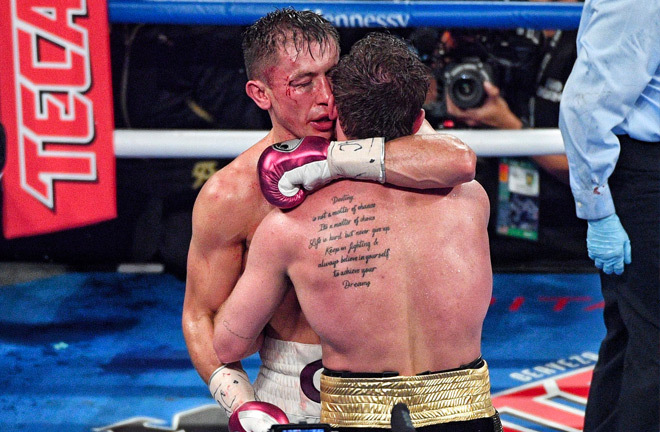 Despite the bad blood between both fighters – they managed to embrace at the end of the fight. Photo Credit: Twitter – @PowersImagery. The fighters embraced at the final bell showing good sportsmanship despite their bad blood and the pre-fight drama. Alvarez was unable to back up his bold pre-fight claim that he would win via knockout but credited his opponent for a great fight. 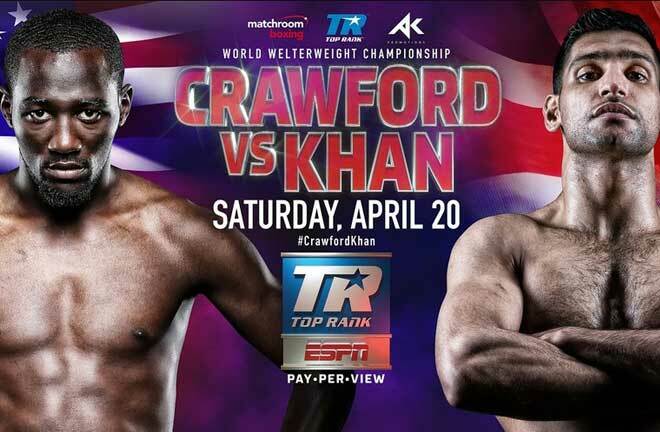 “It was very difficult and [Golovkin] is a great fighter. I tried to do [the knockout], but in the end, it was a great victory for Mexico. I want to thank my corner, which is the best in all of boxing. 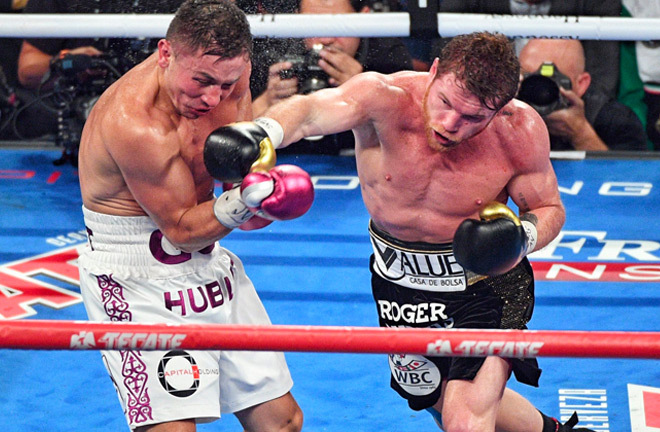 I am a great fighter and I am a great rival and I showed that tonight.” – Canelo Alvarez said. Golovkin sought medical treatment for his eye and did not speak to the media immediately following the fight. He later congratulated the newly crowned champion during the post-fight press conference and offered his thoughts on the fight. Golovkin and Alvarez both indicated their desire for a third fight. The sequel delivered the kind of definitive finish that the egregious scoring and wholly unsatisfying decision stemming from their first fight did not. 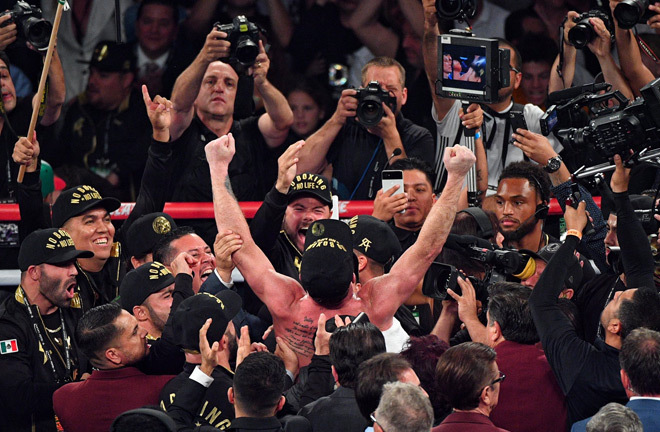 Canelo rejoiced with his team as the decisions were announced.Photo Credit: Twitter – @PowersImagery. 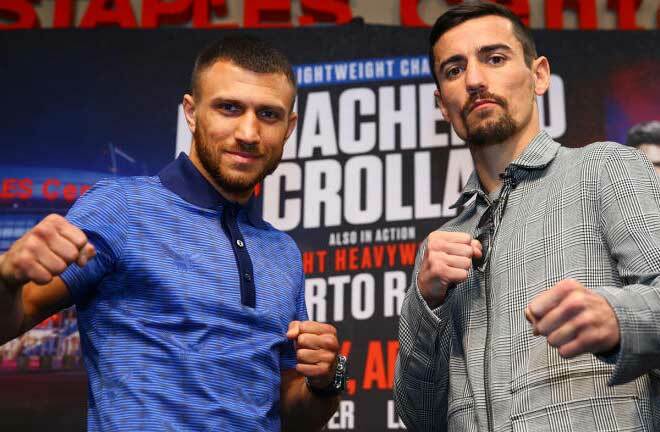 It was a truly thrilling fight in front of a sellout crowd of nearly 22,000 at the T-Mobile and will likely do ridiculous numbers on PPV as well. The fight was much closer than the first and there were several rounds that could have gone either way. That said, Golovkin fans will walk away from this fight with a lingering sense that Canelo Alvarez once again got the benefit of the doubt. The difference this time around is that fewer will be calling it a complete robbery. This scrap had all the essential ingredients of a modern classic middleweight title bout. Bring on the trilogy!